You may remember the post last summer here when I talked about painting those sweet petite french yogurt jars and how my clever sister-in-law collected them from our trip to Paris. I couldn't help but think about that post when I ran across this blog tutorial on converting leaner versions with the same method. You know these retro versions...............the generic ones that come with flower deliveries, the ones you keep too long because you feel guilty throwing away a perfectly good vase even if it's look isn't quite that exciting as some nicer ones in your collection of glass vases. Doesn't everyone have a box or shelf with these around? I thought they took on a whole different status when painted in a lovely array of pastel colours...............they look downright adorable to say nothing about how they would be perfect for use as a sweet "doorstop" gift. Add a few blooms and make someones day. You can read tutorials here and here. Thank you, Sande! hank you for the introduction. It does give them a whole new look, I love the gorgeous shades pictured...so pretty. There's something so compelling and tactile about these. They made me smile. What a great idea for a fun project. Thanks for this and hope all is well! 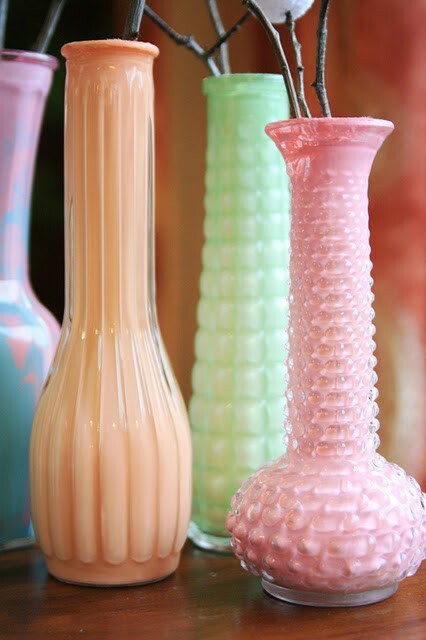 The possibilities are endless...... whoa, visions of pretty glass coloured jars for the holidays are dancing in my head. Oh these are so lovely. Reminds me of rainbow sherbert! So pretty Sande!